If you are a long-time consumer of raw honey, I am sure you have experienced honey that has “turned to sugar”. This is the common slang term for crystallized honey or granulated honey. Some people prefer thickened honey. But, your honey doesn’t have to stay this way. If you prefer liquid honey, learn how to decrystallize honey without destroying it. While it may look strange, crystallized honey is a good thing. This is a natural process of raw honey. It is not spoiled. But you may rather have your honey in liquid form. Most of us consume raw honey because for its nutritional benefits. Raw honey is alive with enzymes, antioxidants, pollen and other natural goodies. 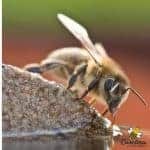 Once the bees have completed making honey it is in its most pure, pristine state. Honey that has granulated or crystallized is a preferred way to consume honey in some regions of the world. When the crystallization process occurs rapidly, the crystals are smaller and smoother. When we allow the slow natural process of crystallization, the crystals are large and gritty. 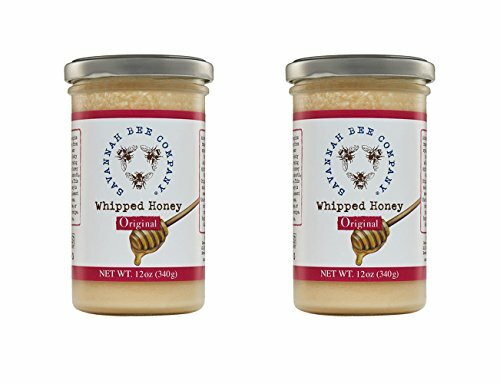 Crystallized honey is sold under the names of spun honey, whipped honey and creamed honey. Consider giving it a try. The good news about crystallized honey (with large gritty crystals) is that it can be brought back to liquid form. Heat will melt the sugar crystals that are forming in the honey. But, too much heat will harm the integrity of your honey. The most important aspect of knowing how to decrystallize honey is speed. Or a lack of speed – it is best accomplished slowly. Yes, you can take that jar of thick, cloudy honey and restore it to a smooth liquid state. We want to restore honey using a slow controlled heat. No part of the honey should become overheated or scorched. Read more about crystallized honey- here. Heating Honey – How Hot is too Hot? This is a common debate among honey connoisseurs. Most agree that temperatures over 110°F damages enzymes and anti-oxidants in raw honey. And, any thing over 140°F ruins the natural properties in raw honey completely. While 110°F may seem to be quite hot, keep in mind that your honey probably gets that hot or hotter in the hive. On a hot South Carolina day, I would not be afraid to bet that areas inside my hive are near that temperature. 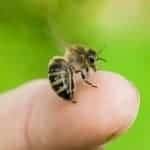 Bees do regulate the inside hive temperature, but they are still at the mercy of mother nature. My feeling is that gentle warming of the honey to a reasonable temperature does not damage the product. The easiest way to bring honey back to a liquid state requires only a few items. We want to create a “hot tub” figuratively speaking for our jar of honey. If you buy honey in glass jars, this is easier. (But don’t worry if your honey is in plastic, we can use another method that I will discuss shortly.) Your glass jar of honey should have a lid on it to protect the honey from moisture and a little room for expansion. Place the sealed jar of honey in a large bowl or other container. Now, we want to heat some water in another pot. Water boils at 212°F but we don’t want to get our water that hot!! Heat a small amount of water to about 110°F-115°F. 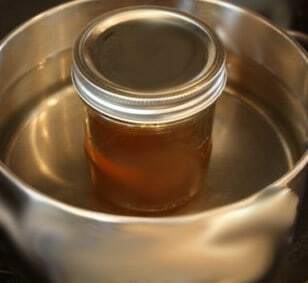 Slowly, pour the hot water into the container around your jar of honey. As the water begins to cool, you can keep adding more hot water if needed. However, don’t add water over the top of the jar – even though we do have the lid on. You have to go slow in this process. It takes time. How long it takes you to complete decrystallize your honey depends on several things. Major factors include: the amount of honey in the jar. And, how solid the honey is set up. Can You Heat Honey in the Microwave? Have mercy, no! Please don’t microwave your honey. Microwaving does not evenly heat the food. The microwaving process will damage your raw honey. If you have a crystallized plastic bear, you have a extra step to perform. Putting a plastic bear or any plastic honey container in hot water may result in melting. And, as we have already discussed the microwave is not a good option either. You will melt your bear and ruin the nutritional value of the honey. You have a couple of options. If the honey is thick but not solid, perhaps you can transfer it to a glass jar. And proceed with a hot water bath. What if the honey is solid in your plastic container? Create a water bath similar to the one outlined earlier. But, this time keep the water temperature lower than 100°F. It will take a while, but you may be able to loosen the honey enough to pour it out of the plastic. Then you can proceed with the first method of a hot water bath. Do you own a car? Some people report excellent results decrystallizing honey in their car. If you live in a region with warm temperatures, you may be able to heat your honey inside the car on a sunny day. How hot the car interior gets depends on the season and your location. It is important to monitor the inside temperature of the car to avoid damaging your raw honey. Beekeepers often store their honey harvest in sealed 5 gallon buckets. It is not unusual for honey to turn solid in the bucket. This situation is not unique to beekeepers. Others who practice bulk food storage may experience granulated honey. For home use, scoop out the amount of honey that you think you will use soon. Liquefy only the amount of honey you want to use. This allows you to avoid exposing the whole bucket of honey to heat unnecessarily. 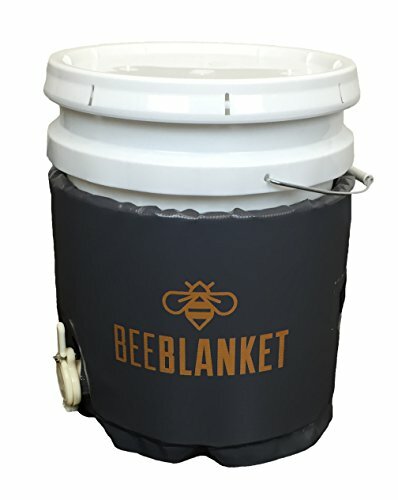 Another option for bulk storage of honey is a bucket wrap heater. This product fits around the bucket and warms the honey. It is even safe to use on plastic pails. The honey inside will not be damaged by the slowly warming heat. Beekeepers often bottle honey in jars before it is sold. It is hard to know what size container your customers will want. You may end up with a case of jars that doesn’t sell as quickly as desired. And, that honey may crystallize. The problem is that most consumers don’t understand granulated or crystallized honey. They fear that the honey is damaged in some way. It is not. Crystallized honey is just as nutritious as liquid honey but it doesn’t sell as well. If you are a beekeeper with multiple jars of honey to decrystallize, you can make a warming cabinet. A warming cabinet is easy to make and use. It works wonders when you have several jars of honey to warm. Learn how to make your own warming cabinet in my post – here. Honey is best stored in a warm dark place. Cool temperatures promote crystallization. You can learn more about why honey changes form in another one of my posts – here. But, remember that crystallized honey is still good. Don’t throw it out.